There is a space near my signature to do either a tiny sketch or personalized dedication of a few words to you, let me know how I can personalize your print to make it unique for you! Limited edition of only 100 prints, printed on archival paper, with archival ink, each is signed and numbered. 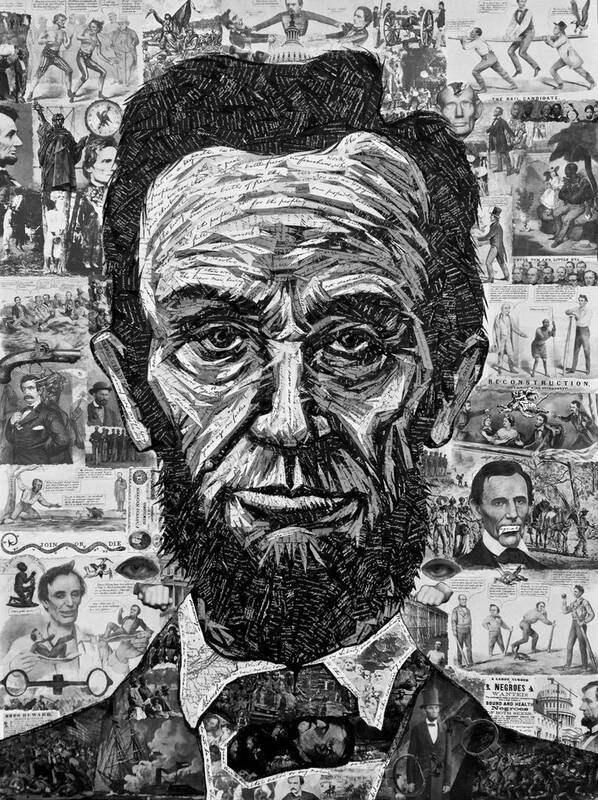 Finest quality giclee print of the original hand cut paper collage portrait of Abraham Lincoln by Josh Cote. This is an exclusive single edition print. The original collage-painting is 32 inches tall and 24 inches wide, made of hand cut paper, antique book pages, vintage images. All paper was cut from original source books. Abraham Lincoln's hand-written Gettysburg Address and letters and bill of rights were used to create the face. Literally hundreds of hand-cut and glued pieces of paper, several weeks to finish one of this scale! Please allow 2-3 weeks for delivery. Limited edition of only 100 prints, signed and numbered. 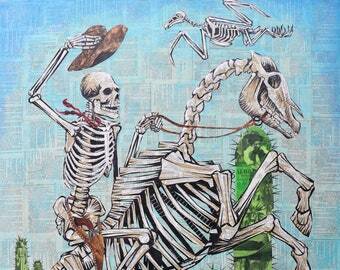 Archival paper and ink, with eye-popping detail! Large format, print is 21 inches tall by 16 inches wide. An exquisite reproduction, every detail from the original is visible! Siren's Song, 20 inches X 20 inches limited edition signed giclee print, a sailor’s doom the song of the deadly seductive mermaids. 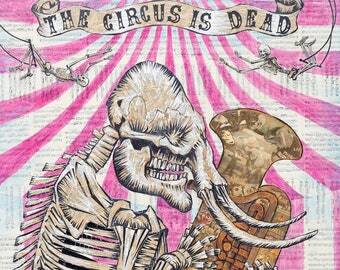 An exquisite print of “The Circus is Dead”, my favorite (so far) collage by Josh Cote! The print arrived on time and packaged extremely well. Thanks Josh❤️ I can’t wait to have this framed along with “Sunday Drive”!!! Great print of a fabulous original collage. It arrived quickly and packaged superbly. The little personal touch by the artist makes it even more special! I accept payments through Etsy. 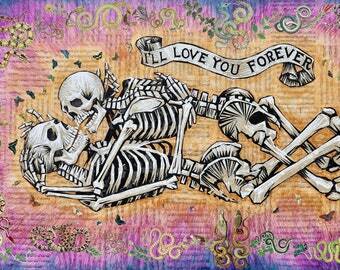 I am positive that you will love your new giclee print. But if for any reason you are not satisfied, please return it to me and I will refund the original price of the sculpture. Return shipping is at the expense of the purchaser. All prints are shipped via US Postal Service. I would be happy to ship by UPS or FedEx upon request, but these prices vary and will increase the cost so please contact me for a shipping quote. International shipping rates vary widely. If you live in a location outside the US, please contact me prior to purchase for a shipping quote.